Twenty-five percent more pets would survive emergency situations if their owners had simply used one first-aid technique on their companions prior to getting to the veterinarian, animal health experts say. Simple first-aid procedures - like knowing how to apply pressure to a source of bleeding and affixing a temporary bandage - can make the difference between life and death, according to the American Animal Hospital Association. THE HUNT OF HER LIFE, is a nonfiction book about Samantha, an unwanted rescue dog who the author adopts at age 2. 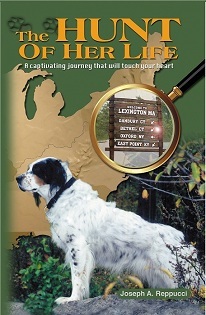 This nicely designed full-color book, by longtime newspaper journalist and MySetterSam.com publisher Joseph A. Reppucci, contains more than 60 beautiful color photos of dogs to help illustrate the compelling and uplifting story of Samantha - a pretty tricolor bird dog who uses her warm personality to win people over and build a new family after being put up for adoption by a hunter because she is gun-shy and afraid to hunt. Learn how she uses her special bonding abilities with people to help her eventually make a transition from the hunting fields to family life. While reading the The Hunt of Her Life, you will travel with Samantha and the author along a trail filled with surprising twists, sudden turns, mystery and even what some call a miracle. And when the journey is finished, you may never look at people and their pets, motherhood - and perhaps even God - in the same way. The Hunt of Her Life is must reading. It will take you on a captivating journey - a trip like no other - that will touch your heart. MySetterSam page at Createspace.com, the book's publisher. Createspace.com is a division of Amazon.com. “An emergency situation can be handled much faster and more appropriately if an owner has resources like a first aid kit and list of important phone numbers (veterinarian, emergency animal hospital and poison control) easily accessible,” Emily Pointer, a veterinarian at Bergh Memorial Animal Hospital in New York City, states in a media release. Pet parents must be prepared to deal with emergencies, Dr. Pointer said. They should think about the most common accidents and take action to prevent these emergencies. Like people, most pet accidents happen in or nearby the home. Common pet accidents include ingestion of a toxin, dog bites, high rise syndrome, ripped toenails, ingestion of foreign objects causing gastrointestinal problems, eye emergencies, broken bones, trouble giving birth and being hit by a car. Sterile gauze pads, first-aid adhesive tape and cotton swabs/applicators. Small bottle of 3 percent hydrogen peroxide. Styptic pencil or cornstarch (stems blood flow from minor cuts). Antibacterial ointment and antiseptic cleansing wipes. Sterile eye/skin wash and eyedropper. Digital or rectal thermometer in a plastic case. Leather work gloves and latex gloves. A leash and thin rope. Burn gel, an instant cold pack and lubricating jelly. A blanket and safety pins. Hand-cleansing wipes, alcohol wipes and sting relief wipes. Splint materials such as a tongue depressor, 12-inch wooden ruler or thick magazine. Animal emergency hospital/animal poison control contact information.